Asked to describe an eggplant, most would mention dark purple, glossy, and shaped like a very large teardrop. The nutritious eggplant, also called brinjal or aubergine, is a very low calorie vegetable, it contains many vitamins and minerals that are beneficial to one’s health. Eggplants are a good source of antioxidants, dietary fiber, vitamin C, vitamin K, niacin, vitamin B6, folate, and manganese. Just as other colourful vegetables, this vegetable has too a lot of health benefits. Eating eggplant a few times a week in a meal can help relax blood vessels all over the body thereby improving circulation and keeping cholesterol at healthy levels. The heart-healthy benefits of eggplant don’t end with limiting cholesterol. Eggplants are high in bioflavonoids, which are known to control high blood pressure and relieve stress. Further, this vegetable is an also good source of minerals like manganese, copper, iron and potassium. Potassium is an important intracellular electrolyte helps counter the hypertension effects of sodium. All this in turn lowers the risk of heart diseases. Eggplant is very low in calories and fats but rich in soluble fiber content. 100 g provides just 25 calories but contributes about 12% of Daily Value of fiber. The fiber makes us not easily hungry and helps speed up the metabolism process. This feature makes it as a healthy diet for people who want to lose weight. 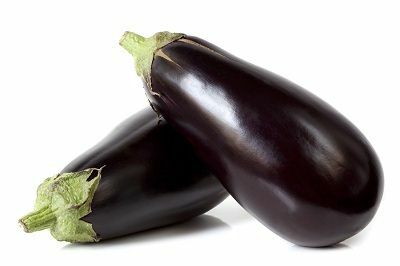 The power of fiber in eggplant continues, the high amount of fiber in eggplants helps push waste, toxins, chemicals and pollutants out of the body, that will protect against colon cancer, prevents constipation and keeps the digestive system working properly. Find more foods that help digestion. Phytonutrient found in eggplant called nasunin, which may help the development of our brains and protects cell membranes from various damages. In addition, The high amounts of B-vitamins in eggplants have the ability to keep us thinking clearly and avoid stress. Eggplants are rich with phenols, the antioxidant properties of which actually help control blood sugar levels among diabetics. Moreover, eggplants are also a very rich source of low soluble carbohydrates. This makes it is highly beneficial to a person suffering from type-2 diabetes. Quitting smoking is very tough for many people, however, there are some foods can help you kicking the nicotine habit. Eggplant contains small amounts of nicotine, which may help smokers curb their cigarette cravings while they are trying to quit smoking if they add eggplant to their diet. Don’t worry, you’d have to eat 20 pounds of eggplant before you experience the same effects as smoking one cigarette. Therefore, doctors advise smokers to eat eggplant – this will help reduce the craving for tobacco.